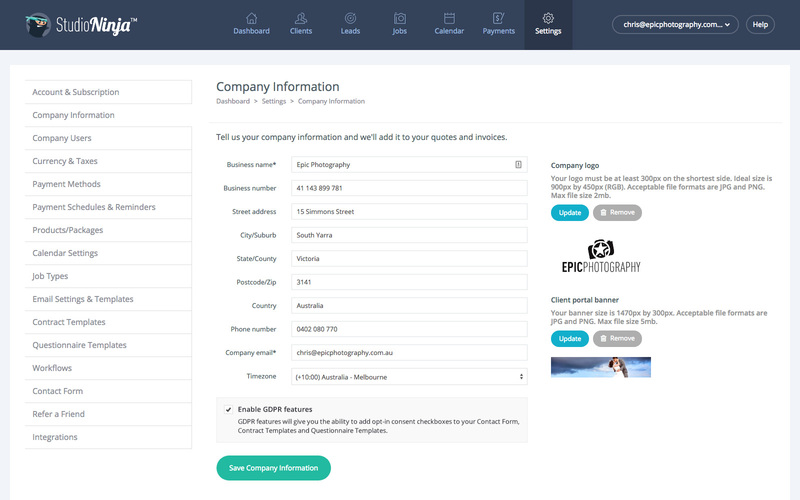 All the information you add here will appear on your invoices and quotes. Some of these fields will already be pre-populated based on the information you provided during registration. Note for EU users: You can enable GDPR settings here. It's really important that you upload a logo because the logo will appear on your quotes, invoices, contracts, questionnaires and client portal. The ideal size of your logo is 900px X 450px. You may also want to upload a banner. This banner only appears in your client portal. The banner is a great way to add some additional branding and also some colour to your client portal. The ideal size of your banner is 1470px X 300px. IMPORTANT: Please save these files as either JPG or PNG in RGB colour. Uploading a CMYK image will not work.